Aztec Imports has over 25 years experience in the manufacturing of promotional pinatas for all occasions. 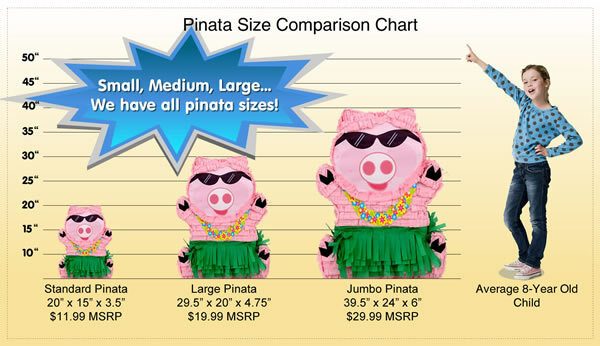 Whether you need to order a dozen or several thousand promotional pinatas, we will be happy to help from price quoting, samples, manufacturing and shipping to your end customer. For more information on promotional pinatas please contact al@aztecimports.com or call him at 915-858-2287, ext 13. Please contact us if you're looking for quality custom made pinatas. To provide you with a quote please send an image of the object/person you want to have made into a pinata to al@pinatas.com. For custom made pinatas please allow a minimum of two weeks from date you place your order to shipment date. For more information on custom made pinatas please contact al@aztecimports.com or call him at 915-858-2287, ext 13. To protect our wholesale pricing, only registered resellers will be able to view wholesale pricing. We invite resellers to become a registered user by clicking here. 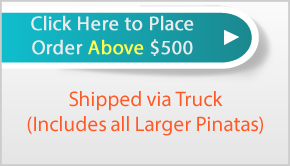 Aztec Imports, Inc. is America's leading wholesale pinata manufacturer. This family-owned and operated business started in 1988 and has sold millions of wholesale pinatas to hundreds of online retailers and stores. Click here to know more about our company, America's largest wholesale birthday party supplies distributor. 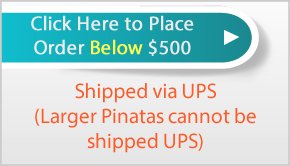 Click here for a complete list of our wholesale pinatas and party supplies. Our pinatas are meticulously designed to be packed as freight-efficiently as possible. If you prefer to browse our products by theme, click on the categories from the left navigation menu. Copyright © 2007 www.aztecimports.com. All Rights Reserved.